The Barents Sea cod fishery is the single most important fishery for Norway, both commercially and in terms of maintaining viable communities along the coast. Since 1976, this fishery has been managed bilaterally by Norway and the Soviet Union/Russian Federation through the Joint Norwegian-Soviet/Russian Fisheries Commission. How do we get fishermen to comply with regulations? How do we get the Russian party to comply with its international obligations, including those concluded at the bilateral level with Norway? These questions resonate with social science theories on compliance at two levels: individuals' compliance with regulations and states' compliance with their international commitments. While traditional perspectives view enforcement and other coercive measures as most important in bringing about compliance, critics emphasise the potential of various discursive measures, e.g. bargaining about compliance with target groups after a rule has been adopted (at the individual level) or a treaty concluded (at the international level). 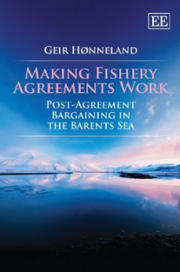 While as yet largely unstudied, Norwegian authorities apply a range of discursive measures, or post-agreement bargaining, in their efforts to bring about compliance at individual and state level in the Barents Sea fisheries. The project will investigate the effects of these efforts and make the findings relevant for adjacent (law) and more distant (fish biology) fields of study. Cheltenham/Northampton, MA, Edward Elgar, 2012 (hardback), 2013 (paperback),160 p.
Ocean Development and International Law, Vol 45, No 2, 2014, pp. 186-204.